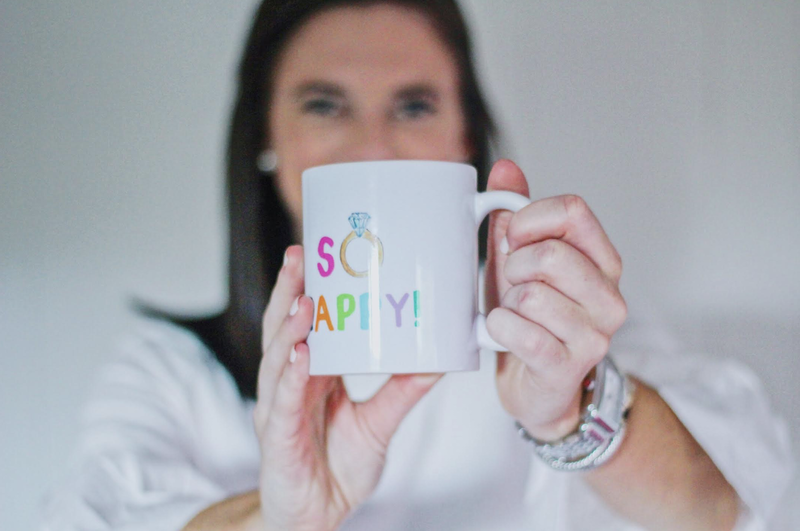 After sharing the exciting news that one of my oldest best friends got engaged this weekend (see more about that in this post), I thought it was about time to share my go-to engagement gift, Evelyn Henson’s So Happy mug. As with so many occasions, I love finding something unique to give to friends, and this mug fits the bill. I’ve given it to Sophia (and even eagerly agreed to be her Maid of Honor with Evelyn Henson’s OMG card) and sent one to my brother’s fiancé aka my future sister in law, Shannon, once they got engaged. It only made sense that Kate needed one too. Fortunately, I think this wraps up the close friends I have that are getting engaged for now, but I’m glad to have been able to gift them something special to celebrate this momentous event. I think engagement gifts can be kinda tricky since they definitely aren’t necessary but for close friends, I say go for it! Proposals seem to be getting like bigger and bigger ordeals from the planning that goes into it, photographers, surprise parties afterward, and the rest of the works that were included in knowing the details for friends is a privilege and a happy to let them know how excited you are is a nice touch and reminder once the rush of the day has gone away. I love everything that Evelyn Henson does, and her mugs have become a daily staple in my life. I drink out of one of her cute mugs (non-engagement of course, haha) every morning and they are such a happy way to start your day. I also have a number of Evelyn’s prints in my room and throughout the house which would make really cute gifts as well. Since Evelyn has so many sweet gifts for a Brightly Decorated Life, we’re teaming up to do a giveaway for a gift card to her site that will be live on my Instagram very soon! Whether you’re gifting yourself or a friend I can assure you it won’t take long to spend it! This is such a cute mug! 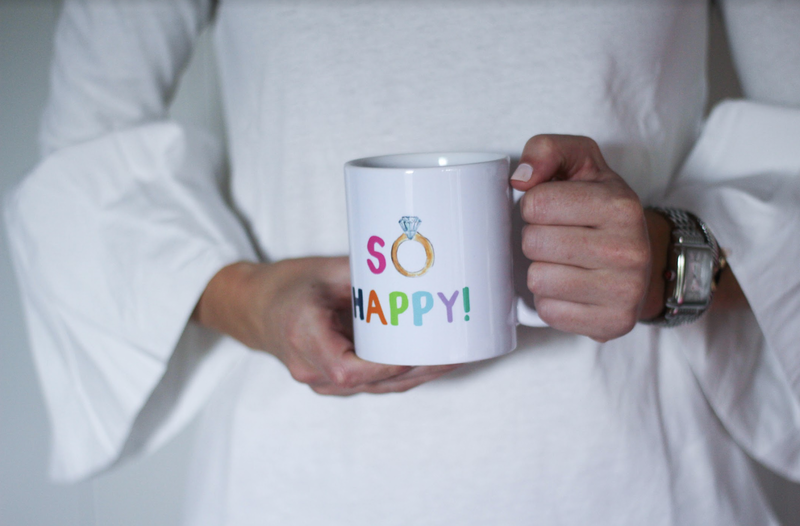 None of my closest friends have gotten engaged yet, but I'm keeping this mug in mind!